GHOULIES II: If You Can’t Beat ‘Em, Gremlin-ize ‘Em – Schlockmania! Though it was shot around the same time as Gremlins, Ghoulies was accused of being a Gremlins knockoff. The title and marketing campaign did it no favors but the first installment of this series was actually a black-magic/possession flick where the titular midget beasties were just a side attraction. It wasn’t until Ghoulies II that this series really picked up on Gremlins-style monster mischief. Along the way, they created a little monster movie potboiler that will amuse the ’80s horror fanbase. Ghoulies II shifts the titular creatures to a carnival setting. A fairground haunted house attraction run by Uncle Ned (Royal Dano) and his nephew Larry (Damon Martin) finds itself in trouble when the traveling carnival they work with is taken over by snooty yuppie Hardin (J. Downing). The new boss demands profits and threatens to cut any stragglers loose. However, there’s a secret danger the heroes and the rest of the carnival don’t know about: the titular creatures hitched a ride on Uncle Ned’s train and are soon running amuck on the fairgrounds. It’s up to Damon to take them down with the help of dancing girl Nicole (Kerry Remsen) and actor-turned-barker Sir Nigel (Phil Fondacaro). It’s gonna be a slimy night on the midway. Ghoulies II is the kind of modest, fan service-minded “horror lite” fare that it seems to be: the storyline is built around familiar characters and plot devices, there’s plenty of goofball campy humor in the approach to horror and it leans heavily on its puppet monsters to keep the action going. However, none of these things make it a bad film. In fact, Ghoulies II has a “comfort food” appeal to anyone who appreciates the kind of ’80s horror fun that a lot of Empire Pictures product embodies. As usual with an Empire film, the solid sense of craft is part of the appeal. Veteran filmmaker Albert Band handled the reins here and he goes for a straightforward, pace-conscious approach that keeps its mind on cheap thrills. It looks very good as it was shot by regular Fulci cinematographer Sergio Salvati. The script is also a little better than you might expect because they got Re-Animator/From Beyond scribe Dennis Paoli to do the honors. He in vests the proceedings with above-average dialogue for this kind of film and the occasional moment of effective drama, particularly with the Ned/Larry relationship. However, the monsters are the thing in Ghoulies II and John Buechler’s effects team delivers all the charmingly cheap latex monsters you could ask for. The designs are a little more complex and interesting here and there’s even some bits of stop-motion effects in a few places. The final reel is non-stop monster mash material, complete with a giant ghoulie. 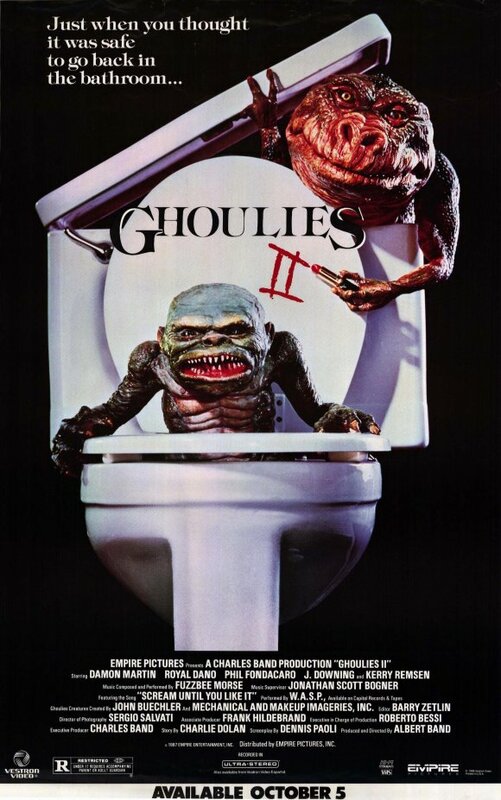 In short, Ghoulies II is the kind of tasty celluloid junk-food that Empire Pictures built its cult reputation on. As far as Gremlins-inspired mini-monster riffs go, this is one of the most amusing and the perfect kind of thing to watch at 2 a.m. when you need a fun horror quickie to close out the night.